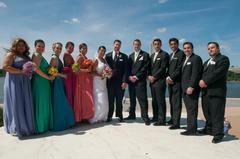 WINNER of the 2011 BRIDE’s Choice Awards by Wedding Wire.com! Washington Talent sits atop the foundation of providing the area’s top Entertainment and Wedding Bands in Maryland (offices in Rockville & Baltimore), Virginia and Washington, D.C. 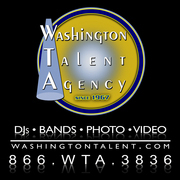 The Washington Talent Agency has always looked to provide the best event services in the industry. Over the past 40 years, WTA has grown to provide MCs and DJs, Photographers, Videographers, Event Lighting, Dance Floors, Novelties and of course; Live Bands for Weddings, Mitzvahs, and Corporate & Social Events. Washington Talent Agency would be more than happy to try and answer any questions you have about their services or getting married in the local area. "DJ Mark Wilner was our DJ and he was professional and did everything to my liking and my guest were happily dancing the whole night." 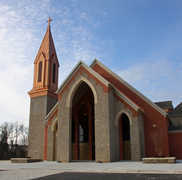 "Brian Violett was a great DJ at our wedding. He was professional, good at his job, and did exactly what we asked for!" "ENCORE was amazing! They had everyone out of the dance floor all night, playing music of all different types! The F&B Director at the hotel even said they were the best Wedding Band he has ever seen in 20 years of being in the business!!" "The band leader, Carroll Higgins was amazing. He made great suggestions but also did exactly what we wanted. He knows how to get a party going and keep it going. Within 20 mins of our reception start we had almost everyone on the dance floor! We had music for everyone's taste, and the volume was perfect--great for a party, but not too loud people couldn't talk." "They were friendly, organized, and did a great job getting people up on the dance floor." "SO seriously its more then a dj... and O boy... did I hear that over-and-over... but, honestly nothing beats live music... especially an interactive band like The Prelude.... They were nothing short of Fantastic. I had an in studio rehearsal with this 7 piece band (four vocals- lots of variety) and booked on the spot... They are extremely talented covering Motown - Current hits. There was a musical something for everyone.... My first dance choice was not on the "provided list of songs" so for my wedding the band learned "Lover Lay Down" - DMB ... and it was performed flawlessly.. Everyone danced (including our wheelchair bound grandmother)... There was not a person in their seats. I looked at about 50+ bands before choosing The Prelude --- worth every penny... It was a very formal event with all of DC's most prominent... and at the end of the night our guests were chanting "one more song".... and so they ended the night with an encore of brown eyed girl... We def suggest spending the extra $ for the additional horns... And at the end of the night my biggest dj-supporting critic said... "glad you stuck to your guns about the band... they were awesome""